The round houses (a.k.a., Fujian Tulou) are unique rural dwellings that can be found in the mountain areas in southeastern Fujian, China, dating back to the Ming dynasty (17th century). A round house is a large, multi-floor, enclosed, and fortified earth building housing usually a whole clan, which functions as a village and is known as “a little kingdom for the family”. Players take on the role of the family head and each vies to be the most important member of the Round House. The board shows the Round House on the left side. There are four large rooms and four small rooms around the outside of the house. One room of each size is pre-printed on the board. The other rooms are filled from a supply of tiles in the box. There is also a wedge shaped ancestral hall which marks the starting point of the ring. 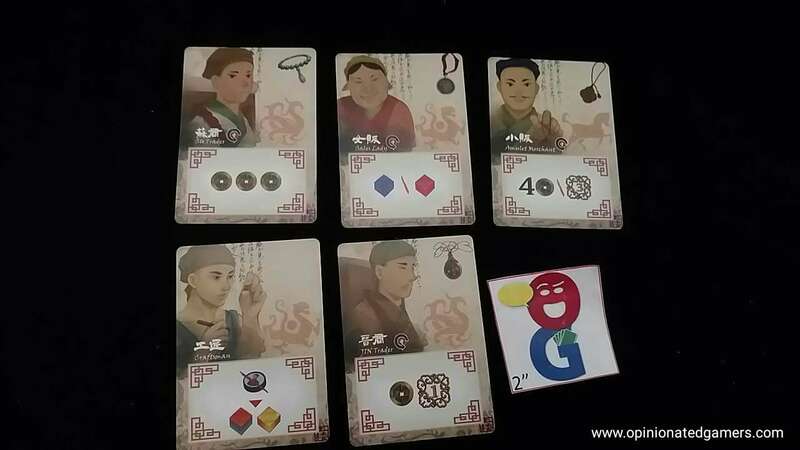 Each player gets their own player board, a family leader token and a bunch of family assistant discs. 1) Activate an Expert Card – choose to activate one of the previously-acquired expert cards. 2) Move a Family Member – move a family leader clockwise around the board from 1 to 3 rooms. This is the only mandatory phase of the whole turn. Other than the Ancestral Hall, there can only be one family leader in a room. While moving, you do not count any rooms that are already occupied. If you move to the Ancestral Hall, you must stop and perform the worship action. 3) Execute the Room Action – you now have the choice to take the action shown in the room where your family leader stopped. Depending on the room, there may be a main action and/or an assistant action. 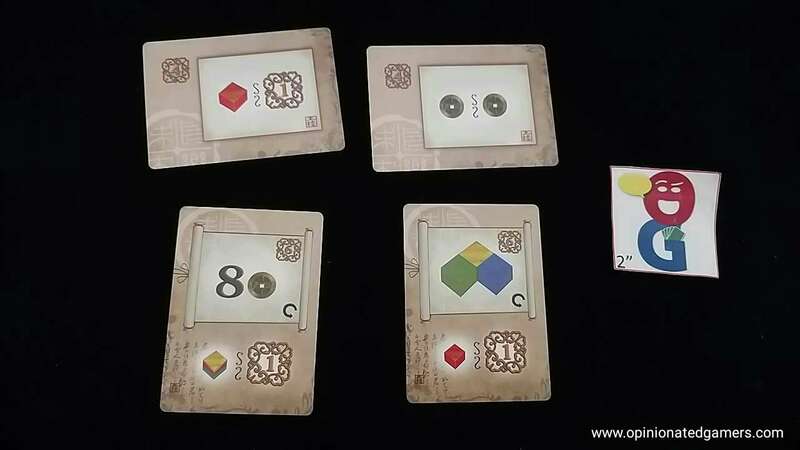 4) Receive Order cards – if your marker has passed a yellow order icon on the score track this turn, you may take an order from the supply area or take an amulet from the supply. 5) Fulfill Order cards – pay the appropriate amount of resources or coins to finish an order card. Turn the card sideways to show that it is complete. There is a permanent effect on the bottom of the order card which you will now get for the rest of the game. Note that these effects can only be used ONCE per turn. Each time that you make a full circuit of the board, you must stop at the ancestral hall and worship. There is no way to skip this part of the board! There are two options when you get here. At the start of the game, 4 Temple tiles were placed next to the board. If one is still available, you can take the depicted bonus and then flip the temple tile over. If you choose not to take a temple tile OR there is not one available, then you must go into the ancestral hall to worship. When you do so, move the round marker by one space. Note that the marker only moves when you actually go into the hall; it does not move when you take a Temple tile. Then, you choose any one of the towns around the board and take up all of your assistants there. Starting in the upper left corner of the ancestral hall, you then place your assistants in an orthogonally adjacent path. If you have any previously placed senior assistants in the hall, you can use them as part of your path. At whatever space you finish placing assistants, you immediately flip that assistant over to the senior side. You then look at the bonuses for the row and column of this last placement and take them. Finally, you score VPs as written on the space you landed on. You also score one point for each assistant you currently have seated in a chair on the main board. Any senior assistants remain in the ancestral hall, all other pieces are removed from the board and placed back in your supply. The game continues until the cube on the round track reaches the designated end space (10 spaces for 4p, 12 spaces for 5p). At this time, each other player gets one more turn and then the game moves into final scoring. Amulets – points for sets of different amulets. Use the chart on your player board. The player with the most points wins. Tiebreaker goes to the player with the most coins. Round House is a very immersive and complex game. The main mechanism at play is resource management – you need to collect the appropriate resources from the different spaces in the Round House to eventually score points. The game gets more complex because it’s not a simple transaction to trade goods for points. Sure, that’s one of the ways to get there – but you also have to manage your money supply as well as your assistant situation. 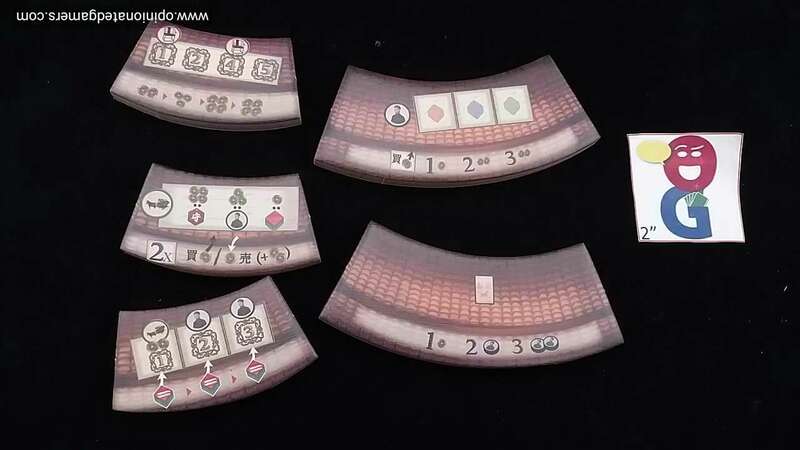 The game has a fair amount of variability from game to game – as some of the buildings are pre-printed onto the board and others are placed down as tiles. Therefore, the order (and possibly identity) of the stalls in the Round House will likely always be different. If you look carefully at the board, you’ll note that the different valid paths will cause you to bypass certain spaces – so you have to plot your path to ensure that you get to all the spaces you want to get to. The game end is triggered by a certain number of visits to the ancestral hall, but I like the fact that all players may not end up going there an equal number of times. The pacing around the round house is left to the player. You could choose to only move the minimum 1 room around the house while others zoom around it taking 3 rooms at a time. This also balances out in the worship department – early on, you could benefit from early Temple tiles, but when the time comes to go into the hall and lay down your assistants, it is unlikely that you’ll have a large number of assistants in any one town whereas a player who took more actions in his circuit could end up having a large number and could thus end up with better bonuses and scoring for his trip. That being said, the additive nature of the worship phase – being able to use previously laid senior assistants – does allow you to build up to a big score if you go there multiple times. The bonus cards can have good in-game special abilities. We played the game quite wrong in our first attempt as we missed the single sentence in the rulebook which states that the effects of each card should be used once per turn. We were getting into a state where some players were able to create recursive loops leading to significant point scores. When it comes time to choose order cards, I would definitely try to choose actions which complement your previously played cards; though sometimes it’s hard to turn down a card which is worth 7 or 8 VPs. In the end, there appear to be a number of different ways to generate points – and they feel fairly balanced. The largest possible score is from the amulets – with a 55VP score going for a set of 11 different amulets. Thus far, the largest set that I’ve seen in my games is 8 for 27VP. The order cards are of varying value –and the lower scoring cards usually offer you ways to score VPs through the course of the game. You can even do OK ignoring the endgame scoring if you are able to use tiles like the Bank well during the game – you could possibly gain up to 12VP coins in a single action here. In any event, you have many different choices on how to proceed with the game, and you will likely need to do a bit of all possible scoring methods to succeed. The decisions can be tough, and there are times when the game slows down a bit as players need to crunch through the decision of which path to take, which places to stop at and which actions to take. Our 5p games have been 90-110 minutes long, which I would expect to reduce a bit once we are familiar with the rules. The components are of good quality. 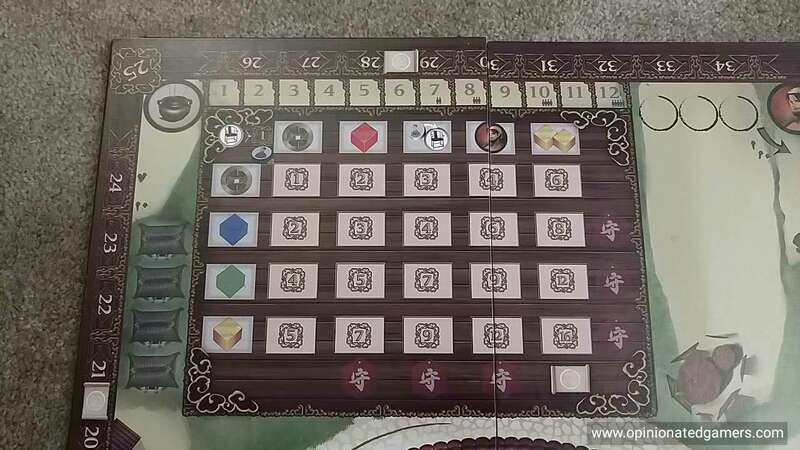 The board in my game is a bit long, it only fits in the box at an angle – but this isn’t a big deal. I’ve put some stuff underneath one side, put the board in at an angle and then put the rest of the bits on top of the board on the other side. I understand that this was an issue with the some of the games at Essen, and a replacement board is in the works. 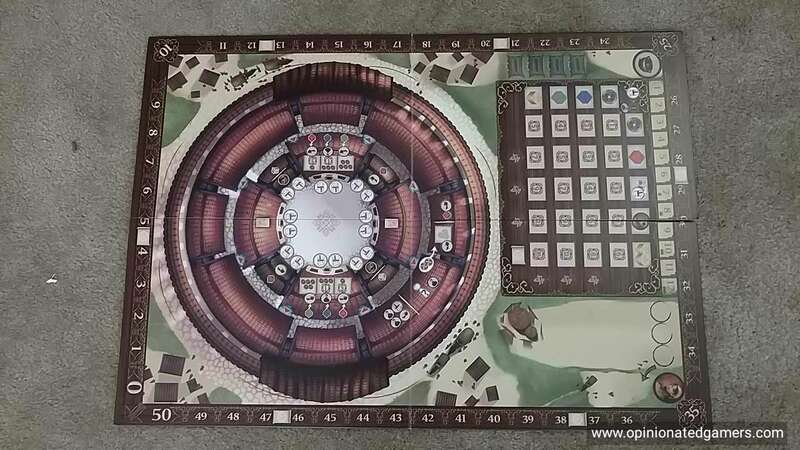 I should also note that the punchboard tiles for are about the thickest I’ve ever seen. I’m not sure if they are completely necessary, but heck, sometimes you just need a game with 10mm punchouts! Now that we’re playing with the correct rules for the order cards, Round House provides a very complex and involved 2 hour experience. 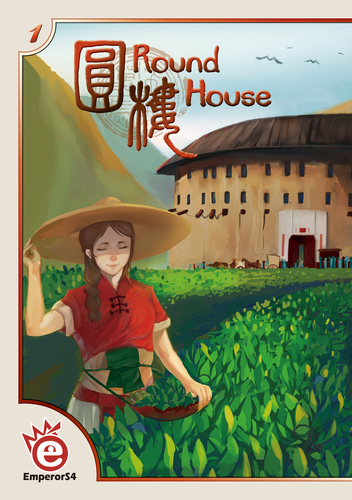 There aren’t any truly unique mechanisms in the game, but Round House does offer a nice combination of ideas that mesh together well. I expect that we will continue to play this through the winter. Lorna: I love that this isn’t a trading game set in Europe. It’s a solid worker placement game. I’ve only gotten one play in but I am definitely looking forward to trying it again. Dan Blum: We also played this incorrectly, so I can’t give a real opinion, but I certainly like it enough to play it again with the correct rules.